Based in London and Istanbul where the exotic east meets modern west, we bring together new technology with old world techniques to produce the highest quality, longest lasting and most beautiful cement tiles and wall ceramics. We also proudly declare that our designs reflect the richness of our culture and our land which have been the home of many different civilizations since time immemorial. Many of our designs are created from the moulds of archaeological findings, combined with a modern art perspective and result in one-of-a-kind patterns and colours. With the expert lead of your Armenian master craftsmen we took the traditional tiles that have still been sitting on dusty shelves 200 years ago, reopened the doors of the ateliers that had been closing one after the other, brought these ateliers back to life with innovative engineering techniques and thus a brand-new collection was created. With decades of experience in ceramics, we are a specialist and unique international exporter of exclusive handcrafted cement tiles, Terrazzo Floor Tiles and Turkish ceramic tiles. Our aim is to create Contemporary Turkish Design and introduce to all around the world. "My favorite material is tiles obviously :) I like wood and marble a lot. I dislike ceramic tiles which are copied the cement tiles pattern. I really can not stand to see the cheap look." "I want them to fall in love with each tile they see or use. As all the pieces would be different than each other I want them to embrace the imperfect. I also want them to think that to produce one tile and to bring them to their environment, to install them to the wall or floor.. there's the sweat of many people behind the process... So I want them to be grateful." 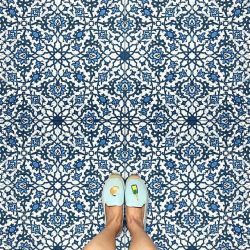 "Istanbul, London, fashion, streets, Instagram"
"Our style is unique as we are the only tile supplier which has a contemporary Turkish art. As Turkey has a very ancient history and used to be home to many great cultures in the past, we carry the designs of the unforgotten pieces. Anything we do is hand made, which is a very unique method among the tile suppliers." "I once visited Efessus, a very ancient Greek place in Izmir, a place where you can see temple Artemis which the Seven Wonders of the Ancient World.Among many other monumental buildings are the Library of Celsus, and a theatre capable of holding 25,000 spectators. I took pictures of the mosaic tiles which were there since 10th century BC and I created the cement tiles using similar patterns and colours." "Soho House Greek Street floor tiles which has bumps on them."